-salt or spice rub (see above). Mix rub ingredients together and apply to tofu slices. Let sit for at least 5 minutes. In a saucepan, heat beans and mash into a chunky paste and beans are heated through. In a skillet or sauté pan, heat oil on medium heat. Place tofu slices in pan and brown on both sides, about 5 minutes on each side. Meanwhile heat bolillos or French rolls in the oven or toaster oven until crisp and warmed through. To assemble torta: Slice bolillo roll lengthwise about ¾ of the way through and hollow out slightly, making room for the fillings. Slather beans inside the roll and place tofu slices and cheese inside bread. Return roll to oven and broil until cheese melts. Remove the torta from the oven and top with veggies. With a sharp knife slice ends off plantains and create a slit down the side of the plantain, making sure to cut only deep enough to remove the peel. Gently remove the peel and slice plantains into ½ inch medallions. In a sauté pan or cast iron skillet, heat oil until it begins to glisten. Slide plantain medallions into oil and fry for 1-3 minutes on each side. Remove and place on a paper-lined plate. 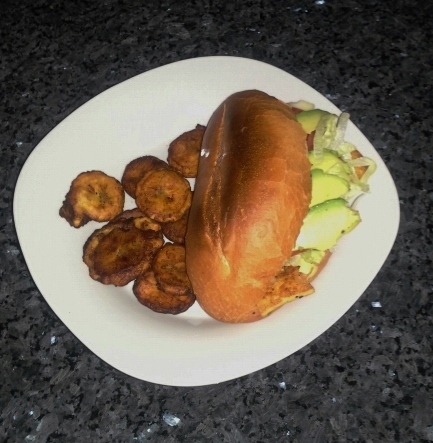 Using a small plate or coffee cup, flatten plantains until they are about ¼ of an inch thick. Place flattened plantains back into the oil and fry for an additional 2 minutes on each side. Remove from pan and place back on paper towel lined plate. Immediately sprinkle with salt or spice rub. Best if enjoyed while still warm. Burger and fries? Please. There is something tastier: The Torta. The Mexican sandwich. 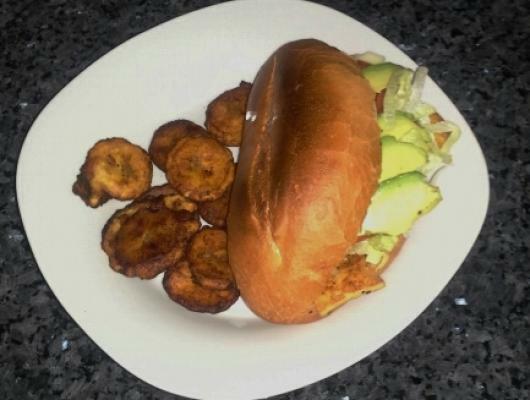 Usually made by taking a freshly baked roll, filling it with beans and protein and topping it off with fresh veggies like tomato and lettuce. For this version I decided to create a spiced-rubbed tofu as the main protein. Add a generous smear of black beans and an abundance of veggies and you got yourself a great looking sandwich. And you know what complements a torta? Plantains! Plantains are the denser, starchier cousin of the familiar yellow banana. They make an appearance throughout Caribbean and Central American dishes and let me tell you it’s a good thing they do because they are delicious. Tostones are plantain rounds that are fried twice (because frying them once just isn’t enough) then sprinkled with salt. If there is any rub left over from the tofu use it to give the tostones a little kick. The end product becomes this sweet, salty, crispy-on-the-outside-creamy-on-the-inside pseudo French fry.